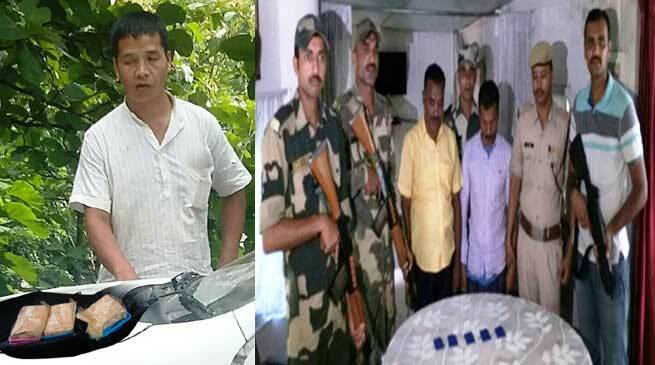 BSF Seized Methamphetamine Tablets, Heroin, Catlle Heads and apprehended three Indian nationals in various different operations conducted at Silchar , Mizoram and Meghalaya . In a another operation on the same day a joint Operation was conducted in area of Edentharbelow company veng, Aizawl (Mizoram), by BSF troops of SHQ BSF Aizawl alongwith Spl Narcotic Cell Aizawl in which, one Indian national namely was apprehended along with 46.11 gms Heroin value Rs 1,35,000/- in international market. BSF spokesperson, Shri Satish Budakoti, Deputy Inspector General, Frontier Headquarter BSF Mizoram & Cachar informed that the seized drugs items were brought from Myanmar for local consumption. The apprehended persons along with seized items were handed over to concerned police station for further legal action. The BSF once again foiled the attempt of cattle smugglers to smuggle cattle to Bangladesh in the area of Muktapur, West Jaintia Hills. A Special ambush party of BSF observed some suspicious movement and rushed at the spot and seized 15 nos of cattle while being smuggled to Bangladesh. However the cattle smugglers managed to escape from the spot taking advantage of bushy area and darkness. In an another operation the BSF troops deployed at Debram, South Garo Hills district and at Bholaganj, East Khasi Hills of Meghalaya in a special drive, seized 46 bottles of liquor while being smuggled out to Bangladesh from India. The Border Security Force has intensified its operations on the Indo-Bangladesh Border to prevent and curb trans-border crimes.